Ms Huang Hui Lin, 24, is so fond of animals that she has been learning about them in the classroom since her days at Temasek Polytechnic. Since childhood, she has always been passionate about the life sciences, particularly in the area of animal sciences. 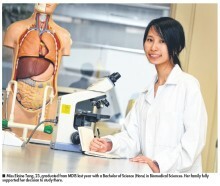 Upon graduating with a Diploma in Biotechnology with a specialisation in Veterinary Technology, Ms Huang took up a job as a veterinary nurse for two years. She realised that she wanted to take her education further while still earning her keep. A part-time degree programme at the Management Development Institute of Singapore (MDIS) seemed like the best solution. 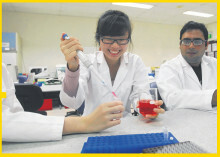 So in 2009, she enrolled in MDIS, and is now pursuing a Bachelor of Science (Hons) in Biomedical Sciences. Ms Huang works in the day as a research assistant at her alma mater and goes for evening classes at MDIS three to four times a week. A typical school day for her begins at 7pm. She would try to fit in a quick dinner after work at 6pm. Classes then end at 10pm, and if there are urgent assignments to complete, she would try to finish all that the same night. How does Ms Huang juggle work and studies? She said: “It’s very important to set priorities right and manage my time well. The only time I have to do my assignments are after work or on weekends. She said she is fortunate that her employer is “very supportive” of employees pursuing higher education and even grants them staff leave for examinations. And although Ms Huang is a part-time student, she enjoys the same benefits as full-time students, such as opportunities to attend networking sessions, seminars and workshops. She said: “These events have taught me professional skills like report writing, data statistical analysis and protocol safety review. “The skills help me complete my assignments and also enhance what I learn on my current job.” And she attributes the conducive learning environment to her lecturers, who she said are “very committed” to helping their students excel. She added: "We also have a few adjunct lecturers from the industry who share up-to date knowledge and experiences. “Sometimes, I also learn from classmates working in related fields. Ms Huang’s degree course takes 31/2 years to complete, but because she has exemptions, Ms Huang is able to do it in just 2 1/2 years. She expects to graduate next November. Intent on fulfilling her interest in the animal sciences, she intends to apply for a scholarship to pursue a Master’s degree in Zoology overseas. She encourages polytechnic graduates to consider MDIS for a fruitful learning experience, but advised that “education is supposed to be a self-exploration experience”. She said: “Don’t be afraid to pursue something different if you really feel passionate about it." Source:[The New Paper 22012012] © Singapore Press Holdings Limited.